Hi Guys,.. have just installed Cloudberry backup onto a ubuntu 18.04 desktop m/c. and I have found no related stuff in the forum for my problem. However, these Windows are all too big,. and for some reason I cannot seem to be able to resize them. Even if I go 'full screen' the cloudberry window is nothing like 'full screen'. Initially I thought this might be to do with my dual screens,.. being at different resolutions.. but alas no,.. the cloudberry window is some 25% bigger than my defined 1920x1200 sized window. if I try to change the window size I get a pop-up display show current screen size ( I assume ) as 802x602,.. but this does not change when I drag a corner in.. and is clearly not the actual size of the window itself.. This is a known issue related to scaling that may be addressed with the following change the launch script. If you have concerns about how to make this change, the Support team will be more than happy to provide assistance. You can reach out from the app by clicking the Feedback button in the toolbar. Tx,.. That edit should not be a problem,.. I'll give it a go later,.. ( busy cooking diner at the moment :razz: ). Tx David,.. That seems to have fixed the start-up window issue,.. I can now register ( as I can see the buttons needed ), and get to the main admin window. However I still cannot resize the main window, even though it is now possible to create a backup,..and there are only icon to collapse or kill the window,.. ie there is no 'full size icon'. 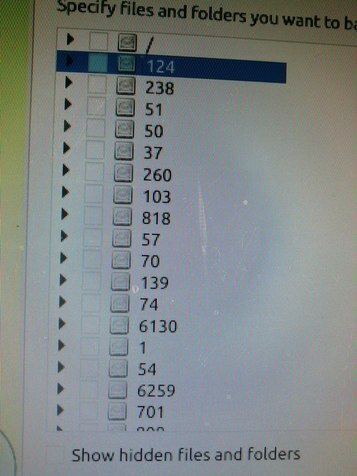 If I then go on to create a backup and select a destination,.. I get the list of places to store to,..
Now the 1st time I called this list,.. the window extended the full extent of the screen,.. ie with lots of blank lines at the bottom,.. however subsequent calls to this menu have produced a normal list. ( strange,.. but just an observation ). 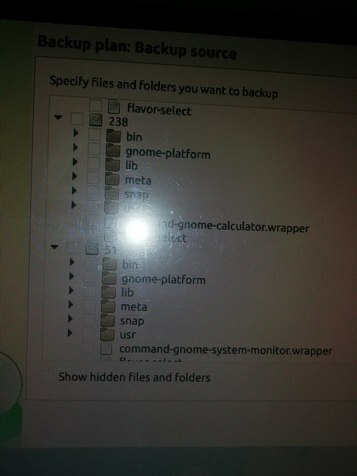 Additionally when I go to choose the folders I wish to back up the folder structure is incorrectly represented,.. its 'just screwy',.. see pictures attached. On the plus side,.. I have created a successful plan, that does seem to be working,..